Arrived to this famous island and was horrified. I was angry at the thoughtless tourists who wandered around the town in tiny little bikinis. How little respect can you have for other people's cultural norms? How hard is it to throw a sarong over your fat, sunburnt arse before you go to a restaurant? I didn't appreciate all the masses of exposed flesh on show, nowhere near the beach, and I'm not even Thai. I felt ashamed of all the white/red people disrespecting the Thai people by not following their rules about dress. It reminded me of that ad (togs, togs, undies). Isn't it normal to cover up a bit when you leave the sand? Otherwise you are just walking round in your undies. I was also angry at the Thai government for letting so many people on such a tiny island. It is going to be ruined soon. Even now, some of the manholes have untreated sewage seeping out on to the foot path. They have very little water to go around - and all these people keep pouring on to the island every day. If these tourists can't even put a t-shirt on when they go in to town, I doubt they are making any special effort to have short showers and save water. A ridiculous 50 tonnes of plastic are thrown away each day on Koh Phi Phi just from plastic water bottles. And you guessed it - no recycling. The island is too small. So they heap all the rubbish in the centre of the island (away from the beaches of course. Don't want the tourists to see all the rubbish that they create). And, not surprisingly, guess where the locals live? Right in the middle of the island, where there is no sea breeze or sea views, just beside the stinky sewage plant and the revolting heaps of rubbish. Yet the people on the island are just desperate for MORE people to come, and buy their clothes, eat at their restaurants and pay for their massages because they all want to make money. It felt as though everyone was trying to make as much money as they could, as quick as they could, since they lost everything in the tsunami. And to hell with boring, no financial gain in the short term things like conservation, recycling and proper utilities. I don't know if they realise what they're doing. Tourists are not going to visit a stinky, polluted little island. They are killing the very industry that supports them. 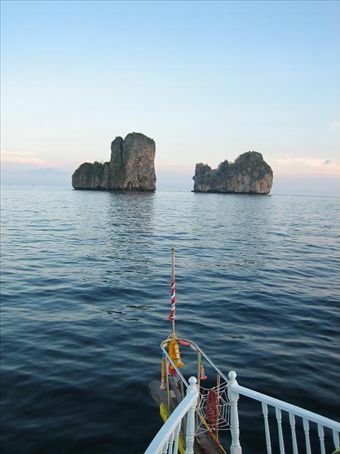 The scary thing is that one of the most famous dive sites, supposedly one of the best in the world, Hin Deang, is dead. The coral has died. And the fish don't swim there anymore. So the divers will stop coming. I feel very sad for the future of Koh Phi Phi.